»Culture & Arts»Reminder-This Thursday (15th) : Rita Braga/Yawning Chasm double bill + N.Sphynx! 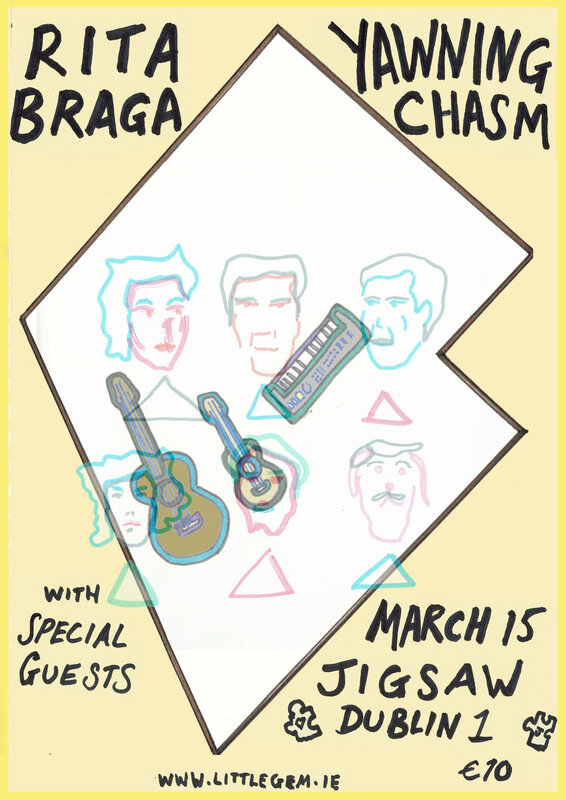 Reminder-This Thursday (15th) : Rita Braga/Yawning Chasm double bill + N.Sphynx! The music of Portuguese songstress, Rita Braga, exudes both the charm of a vintage cartoon character merrily bouncing along, and the ominous melancholy of a lost kitten. Her music simultaneously summons the ghosts of Carmen Miranda and synth pioneers such as Delia Derbyshire and Bruce Haack. Yawning Chasm is the stage name of Galway underground singer-songwriter Aaron Coyne. He is well known to many as one half of electro/guitar band Mirakil Whip, but through Yawning Chasm he explores a modern, ruminative, psychedelic folk-rock. To experience his music live is a genuine treat from another world familiar yet distant. Niall Stafford (Taffin II / French Suspense / Haunted Youth Centre 3) draws from a scatology of influences : Polynesian mythology and war poetry share space with trash cinema and weird tales of fiction, to produce skewed meditations and catchy hooks within songs of immediate charm. ← NI: Rainbow Project Abseil – 100ft off Belfast Castle – do you have the nerve?